Classic American Bicycles by Jay Pridmore (MBI Publishers, 1999). This book covers the many popular brands (Schwinn, Huffy, Columbia, Roadmaster, etc. and includes many color photographs. 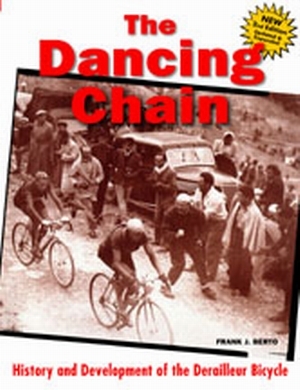 The Dancing Chain: History and Development of the Derailleur Bicycle by Frank Berto, et al. (Van der Plas, 2005). This is an exhaustive volume covering the origins and development of the shifting mechanisms we’re all so familiar with. This book is filled with historical photographs and manufacturers specifications and is a valuable resource for anyone interested in the history of the component manufacturers such as Campagnolo, Huret and Shimano. No Hands: The Rise and Fall of the Schwinn Bicycle Company, an American Institution by Judith Crown and Glenn Coleman (H. Holt, 1996). This is an incredible account of the history and market dominance of family-owned Schwinn Bicycles. The book offers a no-holds-barred analysis of the embarrassing and mostly avoidable financial downfall of one of America’s great bike makers. Cold Beer and Crocodiles: A Bicycle Journey into Australia by Roff Martin Smith (Adventure Press, 2000). This book chronicles the author’s circumnavigation of the Australian continent, from charming seaside towns to blistering desert. The author meets quite a few characters along the way, too. Where the Pavement Ends: One Woman’s Bicycle Trip through Mongolia, China and Vietnam by Erika Warmbrunn (Mountaineers Books, 2001). Erika Warmbrunn writes a captivating tale of her experiences riding a bicycle from Russia into Mongolia and China and beyond. It’s a truly amazing story, and her experiences with the native people of those regions are heartwarming. Over the Hills: A Midlife Escape Across America by Bicycle by David Lamb (Times Books, 1996). The author decides to get on his bike one day and travel from the East Coast all the way to California. This is an inspiring and funny tale of his adventures, filled with just enough bike-geekery to keep diehards entertained for hours. 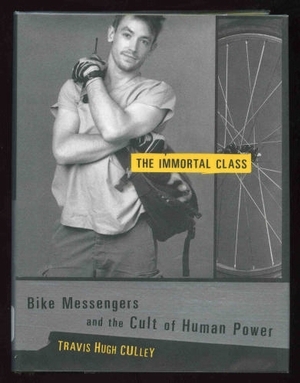 The Immortal Class: Bike Messengers and the Cult of Human Power by Travis Hugh Culley (Villard Books, 2001). This book looks into the mystique of bicycle messengers, those daredevils of the concrete canyons. The author covers all aspects of his experiences and includes a good bit of railing against America’s carbound, consumer-based culture. I HIGHLY recommend this book! Zinn and the Art of Road Bike/Mountain Bike Maintenance by Lennard Zinn (VeloPress, 2005). These two books are some of the best repair manuals currently on the market – filled with useful tips from the man who builds custom bicycles and components and writes the many tech articles for VeloNews.com. Sloane’s New Bicycle Repair Manual by Eugene Sloane (Simon and Schuster, 1991). There may be more recent editions of this book, but this is a fantastic “starter�? repair manual for the budding home mechanic. It covers tool selection and overhaul/maintenance of all major bicycle systems. I have an older edition of this book at home – no V brakes or disc brakes are covered, nor are suspension systems. Bicycling Magazine’s Complete Guide to Bicycle Maintenance and Repair for Road and Mountain Bikes by Jim Langley (Rodale Press, 1999). Here is another great starter manual covering nearly everything one needs to know about maintaining your own bicycle fleet. Again, there may be more recent editions that cover disc brakes and such. Bicycle! : A Repair and Maintenance Manifesto by Sam Tracy (Speck Press, 2005). 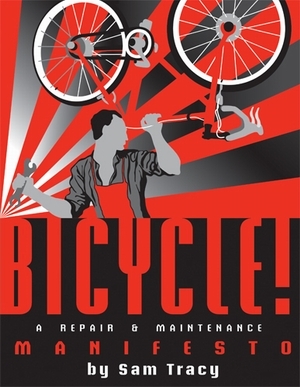 This is an irreverent look at bicycle repair, written in a hip manifesto style. Not terribly well-arranged, but fun (if not particularly useful) information. Anatole by Eve Titus; illustrations by Paul Galdone (McGraw-Hill, 1956). This children’s classic is about a mouse named Anatole who devises a great way to keep his family fed with the finest cheeses in all of France. It’s not about bikes, but Anatole and his friends ride bikes through the streets of Paris. Kids and adults love it!! 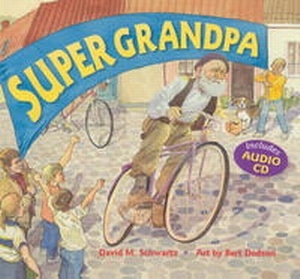 Super Grandpa by David Schwartz and Bert Dodson (Tortuga Press, 2005). Based on a true story, an elderly gentleman is told by race officials that he is too old to race in the upcoming Tour of Sweden. Because the old man is stubborn, he decides to do it anyway, riding through the nights and sleeping during the days. He rides 600 miles to start the race, rides 1000 miles during the race and WINS, then rides 600 miles back home. In the meantime, the old man becomes a national hero. This is one of my favorite children’s books of all time!!! So, visit your local library, and if you have other book recommendations, we’d love to hear about them! I would recommend the quintessential touring book “Miles from Nowhere” by Barbara Savage. I read the book in two days and inspired me to do bike touring…If you do a search on it, you’ll find it has given others the bug too! I wholeheartedly agree with Russ Roca’s suggestion above! Miles From Nowhere would be a perfect addition to your library! Metal Cowboy: Tales from the Road Less Pedaled, by Joe Kurmaskie, is another that I would highly recommend. I’ll look into Barbara Savage’s book. That sounds like a good one! You know, I read two of the Metal Cowboy books…forgot to add them to the list! They’re pretty charming, and Kurmaskie has a great, witty writing style. If you are a roadie or a Lance fan, I recommend his two books. I liked “It’s not about the bike”. Being that I’ve lost relatives to cancer, he inspired me to ride for the LAF last year. “Pedaling the Ends of the Earth”. A couple guys out of college ride around the world. Written early 90s? Pedaling the Ends of the Earth…Yep, that’s a good one, too. The author is David Ewing Duncan…published in 1985 by Simon and Schuster. I’m looking to convert a road bike to a fixed gear. I’ve found several Web Sites that explain this. But I want something really detailed and thorough. Does anyone know of any books about converting to fixie? Jared, it’s really not that hard to convert a road bike into a fixed-gear machine — nothing that would require a fullscale publication. Sheldon Brown’s website (http://sheldonbrown.com/fixed/index.html) is really the “be all/end all” for info you need to do it. If you’ve got the components and the mechanical skill on hand, the whole conversion process takes less than an hour. Much faster than you could flip the pages in a book! I’d like to talk a bit about “Super Grandpa”. I am at a loss to know why it is considered fiction – because it is a true story. I first read about this man in a British Childrens book from the 1960’s that my mother brought home to Canada. An absolutely incredible story – as big as Lance in my opinion. I am a fanatical cyclist and physical fitness buff. In my 40’s. I wonder if that story is one reason?? Hmmm . . . Some years ago I had to visit the Swedish Embassy in South Korea. I had a chat with an older Swedish woman diiplomat In the course of the conversation I suddenly asked her about “Stahlfarfar” It took her a few moments – but then she got it – and was utterly astonished that I as a Canadian would know about it. Oh yes, I knew about it!!! I absolutely love the story, too! The reason this particular book is considered fiction is that David Schwartz embellished the story so that it flows better for kids or something. This isn’t a biography, merely a fun story with an element of truth. It’s like the Texas Chainsaw Massacre, in a way. THAT story is based on a true story, yet it is considered fiction…maybe that’s a bad example by comparison, but I think you get what I’m saying. I’m afraid I can’t agree with your recommendation of The Immortal Class: Bike Messengers and the Cult of Human Power by Travis Hugh Culley. I purchased this book, thankfully for only 99 cents, with high expectations and I made every honest effort to get into its spirit and to like it. Unfortunately the author’s condescending arrogance and his stereotypical portrayals of everyone from himself to his parents to his co-workers not to mention the evil, ignorant general public he endlessly rails against was more than I could finally stomach. What could have been an informative and entertaining story of his down-to-earth experiences was little better than a poor example of a “I’m an oppressed victim” temper tantrum, the rants of a child telling a story to fit his image of himself. A little over half-way through I placed the book under my bed’s broken side rail to get my 99 cents-worth.